Turn Freshdesk tickets into a customer feedback machine. Get 1-click satisfaction buttons in your Freshdesk tickets. Customizable feedback in a flash. Add fresh, engaging 1-click feedback buttons into your Freshdesk tickets. Your customers click (or tap) an icon to show their satisfaction. You will receive that feedback right away. Analyze, measure and react to that data from your private dashboard. Ask for detailed feedback on a customizable landing page. Ask the question that makes most sense to your support team. Use rating icons from our library or create your own. 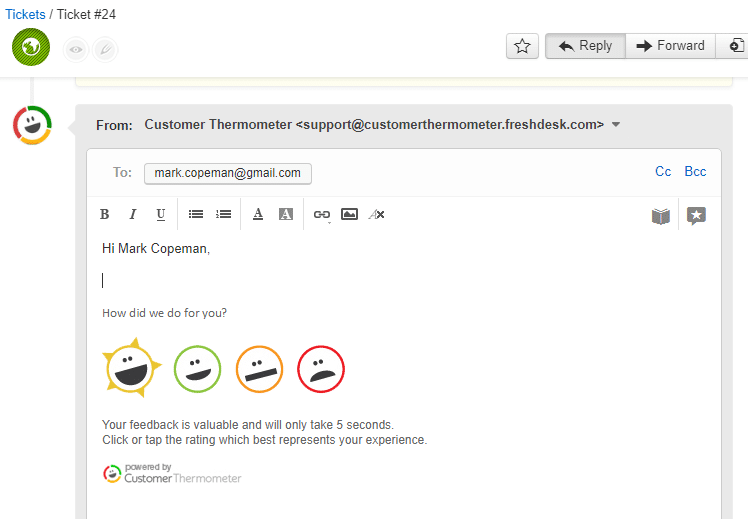 if you’re looking for a fully customizable feedback experience within Freshdesk – try Customer Thermometer today. Integration takes just minutes, allowing you to start reacting to feedback right away. Like what you see? Sign up for a trial account at the bottom of this page. Find out why so many companies are combining Freshdesk with Customer Thermometer to get great results. Try us with Freshdesk. Your first 10 surveys are on us.